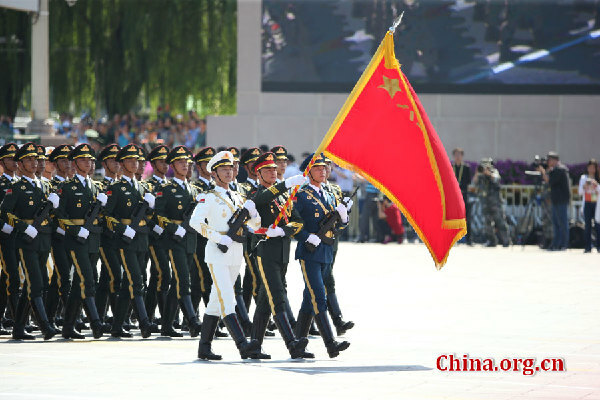 On September 3, the 70th anniversary of victory in the Chinese People's War of Resistance Against Japanese Aggression and the World Anti-Fascist War was commemorated in Beijing. The Victory Day (V-Day) parade deservedly attracted unprecedented global attention as a spectacle without peers. The awe-inspiring parade which lasted for 70 minutes, with 70,000 doves and 70,000 balloons of multiple colours symbolizing peace and diversity, saw the participation of 12,000 Chinese troops who smartly marched with 1,000 foreign counterparts past the historic Tian'anmen Rostrum. It was a display on a grand scale of Chinese military might. More than 80 percent of the modern military hardware on display, comprising of 200 aircrafts, 500 pieces of military equipments including latest missiles system and tanks, was being seen for the first time publicly, effectively silencing a lot of critics about China's non-transparent military set-up. Importantly, by drawing an impressive number of heads of state from nearly every region of the world, including Russia's Vladimir Putin, South Korean President Park Geun-hye, South African President Jacob Zuma and several former leaders such as Tony Blair of Britain, former German Chancellor Gerhard Schroeder and importantly the former Japanese Prime Minister Tomiichi Murayama showed the commemoration's inclusive character. This was also reflected in honoring many war heroes of foreign countries. For example, Anna Chan Chennault, widow of American air force General Claire Chennault, Joseph W. Stilwell, grandson of Joseph Stilwell (commander of China-Burma-India Theater), and M. W. Bethune, the grandson of Norman Bethune, a famous Canadian army surgeon who saved hundreds of lives, were decorated with medals and badges. What was truly memorable was that a Chinese female medical army unit on parade was named after the late Dr. Norman Bethune. Thus, the celebration was as much of highlighting China's great struggle and sacrifice during the Second World War as for acknowledging and honoring many heroes from the faraway corners of the world. President Xi's message of peace has been received positively across the world, especially his political masterstroke in announcing a sizeable reduction in military force levels that should silence many "China sceptics."